YouGov | ​Is social media a boon or a bane for GCC residents? ​Is social media a boon or a bane for GCC residents? on October 10, 2018, 9:39 a.m. In an age of digital technology, social media has emerged as a powerful source of news for the tech savvy generation. While it can be a powerful tool if you know how to use it correctly, misuse of the platforms to create sensationalised news can lead to disaster. In surveying respondents across the UAE and KSA, we found that nearly 80% of respondents claimed to be keeping themselves up to date with news via social media channels, with over a third of the population believing it delivers stories in a short and timely summary. 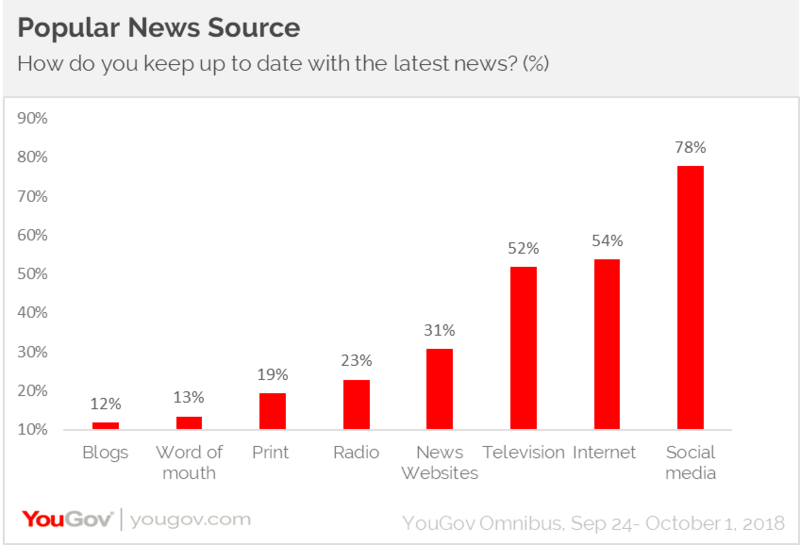 Half of the people consume news more traditionally through newspapers and news sites, with just under a third of all respondents feeling these traditional sources provide a more in-depth, long form of reporting. Most of the people stated International and National news as the most significant news pieces to them, and 53% also indicated their interest in current affairs. However, there are more specific areas of interest across the different genders. While men are more interested in tech news, women are more inclined towards news about health & education. Interestingly, politics is a low priority of interest for people in the GCC countries with around 30% of residents finding it interesting. For females, interest in political news is even lower with only 18% finding news related to it important. 81% of the respondents indicated discussing news with family & friends at least once a week, whether in person, on phone or on social media. Three quarters of them indicated sharing these news stories on social media at the same frequency, a third sharing headlines/stories a couple of times in a week. Taking into account how people are consuming and sharing news, it is interesting to see that while the majority of people get their news from social media, only 14% trust the news from their social feeds. Although 42% clearly display more resounding trust among traditional news outlets, the balance changes across the generations. Those aged 40+ place the least trust in social media sites, in comparison to the younger generation, between 18 - 24 years of age, who feel this towards more traditional news sources. The majority of people (86%) identify the power of the media in general perception, with the same proportion of people voicing concern as to whether what they are reading is factual or fake. 78% of respondents stated knowing what fake news is and believe it is predominately used through online means to confuse people (51%) or advance a specific agenda (47%), or in the case of traditional news outlets to sensationalise a subject (45%). More than half (55%) claimed to be able to know when they are reading fake news, with a lesser number of females (49%) being able to identify this when compared to males (58%). 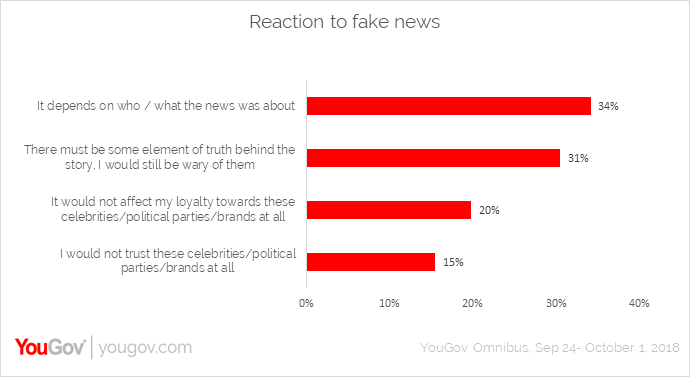 After finding out about fake news, just under half (46%) believe there is still an element of truth or indicated not trusting the person/brand going forward even though the story has been proved false. Females in the UAE and KSA seem to be more influenced by fake news. 40% of females across the two GCC countries disregard a story as fake news depending on who it is about or what it covers. Only 15% females said that fake news would not affect their loyalty towards a person or brand compared to 23% men claiming the same. Kerry McLaren, Head of Omnibus, MENA, said, “I feel there are a number of contradictions present with respondents when looking into how they consume and relate to news. In today’s society everyone is looking for the quicker ways to digest information which is why more recent sources such as social media have become such a popular way to keep up to date with the world. Although social media provides a solution, there are clear flaws taking into account the low percentages of those who trust it as a valuable source of news. Looking at the reactions to fake news from consumers, it is clear that a story being deemed as ‘Fake’ does not present enough proof to dispel and change opinion. Because of this, consumers are losing the ability to think critically and more often than not making ill-informed opinions and political decisions from untruths. Data collected online by YouGov Omnibus among 2,022 respondents in GCC countries between 24th September- 1st October, 2018 using YouGov’s panel of over 6 million people worldwide. Data is representative of the adult online population in these countries.